Fanny Walter is an international speaker, coach, author, Iyengar yoga teacher, and chief happiness officer of Mitcom's, an African company, and Transmed PACA Formation, a French organization. 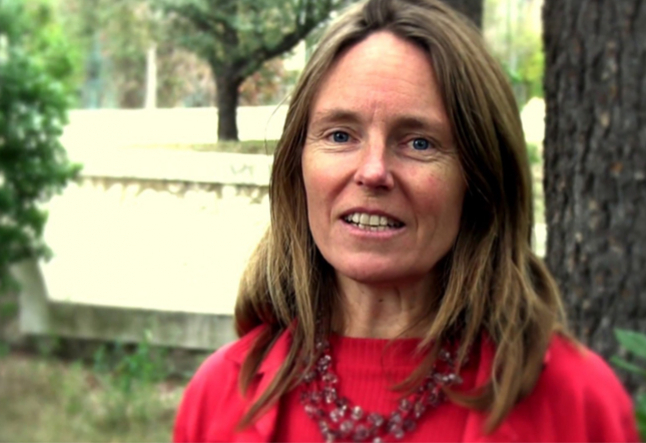 We caught up with Fanny up in her Luberon's family house in South of France, to find out about her past in the corporate world, her fascinating journey towards becoming a coach and the various ways in which she she shares her positivity with the world. YOGI TIMES: You have a background in engineering and working in the corporate world. Can you tell us a bit about that? Fanny Walter: I pursued engineering to follow my father’s path. I worked 12 years as a sales engineer in IT and consulting companies. I started to find it really boring. I didn’t know what was going on. Everything was perfect, I had a nice husband and 2 children. I was living in Grenoble, a nice area where I could go hiking or skiing. I had nice colleagues and customers. Then what? One day, my husband told me that we have an opportunity to go to India, so I jumped at the chance to escape my boredom. I understand now, that it was a crisis. There is research on this topic, and they call it "bore-out". Since then, my dream is to help engineers or companies to escape bore-out, to help them to reconnect to themselves and to give them more of a sense of happiness at work. YT: How did you become a speaker and coach? What was it that inspired you on this path? What was the epiphany? Fanny: I stayed in India for 5 years. I became an intercultural consultant for Safran, a big French company, to help to communicate together the top French management, the middle German management and the Indian company with 100 engineers. After one year, they called me a coach and told me that thanks to my advice they knew how to communicate with each other. When my job for Safran stopped, I did a master in coaching to become a “real coach”. When I came back to France, since my India experience was so transformative, I was eager to share it. A friend proposed that we organize a workshop at Agile Grenoble about Jugaad innovation, the Indian way to innovate. The organization accepted our proposal, but they offered the big conference room. I said, as we are in Jugaad innovation, and the first principle is “transforming all adversity into opportunity”, let’s look at this adversity to be in the big conference room as an opportunity to do my first conference. So I did it. I had so much fun, that I decided to become a speaker. YT: When it comes to the title of “coach” it can be very broad and have many meanings. What are some of the things you help people with? Fanny: For me, a speaker helps to inspire and allow people to “wake-up". He or she helps others reconnect to themselves and dare to live their best life. A coach helps people change from the present situation to the desired situation. I coach managers or entrepreneurs who want to manage and lead their company in an ethical way, with sense of respect to human beings and our planet. I help companies find their values, mission, vision and to learn to manage with love and value instead of fear and lack of budget. YT: Based on your LinkedIn profile you seem to have learned many skills over the years such as NLP, NVC, reiki, yoga, meditation etc.. For some, just mastering one can take many years. How did you manage to learn them all in such a short period of time? Fanny: I recommend that we listen to our intuition, and try to sense if we need a tool or not. It can be helpful if the intention is there. For example, my children live 3 hours away from my place. Learning reiki allowed me to send them energy from a distance. I discovered yoga and meditation in India, because I was deeply curious about the culture of the country. I found that they are incredible tools - very powerful ways to reconnect to ourselves, to our body, mind, emotions, and soul. I then started to practice it everyday. What is important when discovering a tool is to see if it suits you and then to practice it regularly. YT: You have the quote from Mark Twain that reads "They did not know it was impossible so they did it.” This is a great example of what it means to have limiting beliefs, because it is those beliefs that prevent us from being truly great and living with full potential. What do you recommend is the best way to begin ridding us of those debilitating beliefs? Fanny: Yes, I believe that we become our limitations. What I learned from India is that “everything is possible”.To discover another culture helps us to escape some of our limiting beliefs and to dare to go out of the box. I recommend having conversations with many people without judgment, to love them and discover how they live. Then, as a mirror, you will discover your limiting beliefs. In addition to communication and connection, tools like NLP and EFT can really help people break limiting patterns and move forward in their lives. Yoga and meditation are also extremely powerful. YT: Would you like to build a brand or are you content with reaching people through specific channels? Fanny: My brand as speaker is “happiness reveal”. My main subject in conferences is to innovate or manage "in the flow", educating others about the power of intention and letting things go so as to make change happen. To reach my customers, I’m involved in various non-profit organizations and associations, which are extremely valuable to me. I use a wide variety of channels and outlets to reach people, including my coaching, public speaking, writing and social media. YT: What are some techniques you would use in a coaching session? Fanny: To create the connection to ourselves and to others, I often start with a few breaths or meditation, or some stretching or yoga movements. Then depending on the subject, I will propose an appropriate tool. I use mindful listening to the other person involved in the communication, alongside my own intuition. I ask my customers to listen to their bodies and their emotions in order to tap into what they really feel and want. In Marseille, I like to coach after a sailing race, because I find that people are forced to reconnect to their bodies and feel their emotions after such a physically intense and riveting experience. YT: Do you think that sometimes doing something as simple as traveling and getting out of your comfort zone can eliminate certain beliefs we hold onto? Fanny: Absolutely! I strongly recommend that people travel, explore and come into contact with other cultures. Traveling to India was the start of a new career for me, as it enabled me to experience a change in perspective and grow both emotionally and spiritually. Discovering and learning about other cultures can help us learn about different ways of being, thus escaping some of our limiting beliefs and ideas. YT: What do you see for your future? Fanny: More often, I start with a conference, which is then followed by a workshop. I can see myself continuing with this way of working. The world is on the move, and people are looking for more meaning in lives. So, more and more companies are daring to switch to management that is delivered through trust and love rather than fear. But sometimes this requires a big change of beliefs and behaviors, hence experienced speakers and coaches - like myself - are required during the transformation phase. I hope to continue growing my brand and spreading my vision of happiness within the workplace, enabling more people to connect with themselves and with others, and live a more fulfilled life. YT: Are there any other projects that you would like to share with our readers? Fanny: I just launched my YouTube channel. And my book “Daring to communicate Building trust” has just been translated into English. (I am currently looking for a publisher in India and Silicon valley - just putting the word out there). I hope that people will greatly benefit from my vlogs and my book. Let's come together to make the world a happier, more positive place to exist in.